Sullivan Hall is known for its warm and welcoming front porch. With a beautiful view of the historic Ravine, and a centrally located within walking distance to the Case Dining, Powell Student Center, and the Crabbe Library, Sullivan Hall is perfect for students who want to be in the middle of the action at EKU. 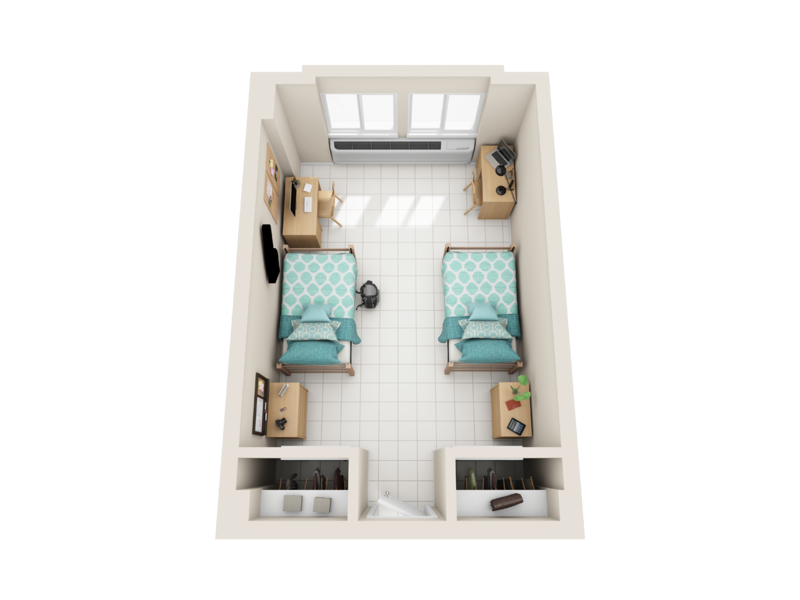 Below you can view an example room layout for the styles offered in Sullivan Hall. Please note, these layouts do not reflect the exact room style and should be used as a general reference. Because of the varying sizes of spaces, exact dimensions for specific spaces are not available. Sullivan Hall offers larger than normal Traditional spaces which house two residents per room and offer a community bathroom. Traditional spaces offer affordable living in a close-knit community where students get involved and easily engage with others. Below are the standard room dimensions for Sullivan Hall spaces. Please note, spaces vary by size and the below dimensions are reflective of a typical room and to be used as a reference only. Exact dimensions for a specific space are not available. One of the benefits to life on campus is the worry-free living! At EKU, not only do you not have to worry about monthly rents, electric bills, or other utilities, you also get free cable TV, Wifi, laundry, and Streaming Service exclusive to EKU Residents! In your room, we provide your bed, dresser/wardrobe, and desk (with chair). All you need to bring is yourself and the decorations to make your new space feel like home! Sullivan Hall offers a computer lab on the second floor and a free laundry facility along with a kitchenette on the lower level of the building.